The wireless LED puck lights are high in bright. The warm lights are 4000K and create a warm and soft atmosphere for you. 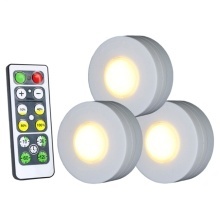 Remote control for turning the puck lights ON/OFF, setting different levels of brightness there is an optional timer that will automatically turn the lights off in 10, 30, 60 or 120 minutes. High bright 4000k warm white LED, flicker-free and anti-glare light without strobes and radiation, it can keep your eyes away from exhaustion. Easy to operate by pressing for turning on/off and long press for dimming or you can control it by remote for turning on/off, setting different brightness and timing function. No damage to furniture with provided strong backing adhesive for fixing the light. Be suitable for kitchen, living room, cabinets, bookshelves and closets. Mini size and light weight that you can carry it easily and free up more space for you.